Shaolin Kung Fu in a full contact ring? Why not! 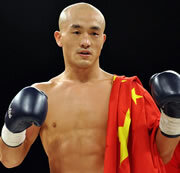 Juts look at lay Shaolin disicple Yi Long, who shines in the national Chinese Sanda tournament, Wulin Feng. 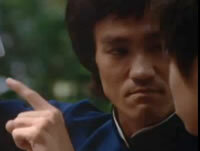 Bruce Lee Remix: Be Water, My Friend! Street performers, coolies, rikshas, thieves and beggars, scholars and rich merchants, busy crowded streets, “flower boats” and opium dens… Last few men with the queues, more of them in western suits… End of colonial times, the melting pot of traditional and modern. “Siuhing Blue Cloud Hall, Leungs Lion and the Dragon dance group and martial arts school in Doutau” (Siu Hing Cheng Wan Tong Dou Tau Leung Gun Lung Si Mou Seut Tyun) is located in Siuhing City and has more than 130 years of history. According to historical records the village ancestors villagers had often to defend a local river port from the incursions of bandits. 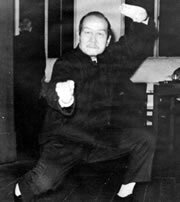 Leung Ji Ban organized and established a local militia, which is a precursor of Leung Ga Mou Gun (“Leung Family Martial Arts School”), which aims to martial arts to keep fit and learn to defend their homes. 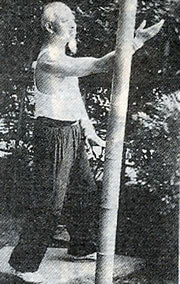 Mok Ga Kyun is famous not only for its profound kicking techniques, but various methods of strength and conditioning as well. 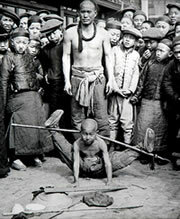 Mok Ga Kyun uses many special devices, such as stone locks, wooden dummy, sandbags, bags for catching and throwing etc. “The Baak Mei Style was derived from the Shaolin style, its place being the Shaolin Temple of the Emei Mountain in Sichuan Province. 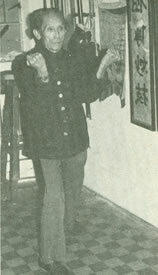 Its founder was none other than the second of five well-known elders of Shaolin Temple, viz. Ng Mui, Baak Mei, Fung Dou Dak, Ji Sin and Miu Hin.